The year is 1194. Sir William of Ivanhoe (Eric Flynn) has returned home to England following the disastrous Third Crusade in Palestine. Ivanhoe’s father, Cedric (Peter Dyneley), one of the few remaining Saxon nobles in an England now dominated by the Normans, has broken off relations with his son due to Ivanhoe’s support for King Richard. The young Ivanhoe doesn’t seem too disheartened by this familial disapproval though, as he has scores to settle – most notably with Sir Brian de Bois Guilbert (Anthony Bate), a member of the Knights Templar. They will not only clash on the tournament field but also off it and two desirable young women – the Lady Rowena (Clare Jenkins) and Rebecca (Vivian Brooks) – will both have parts to play in their bitter feud. Meanwhile, King Richard and Prince John find themselves locked in a grim battle for control of the English throne …. Published in 1820 across three volumes, Ivanhoe – A Romance has proven to be one of Sir Walter Scott’s most enduring works. Its mixture of Medieval derring-do and romance is an intoxicating one, with numerous film and television adaptations serving as a testament to the timelessness of the story. Possibly one of the most notable things about Ivanhoe is how Scott’s novel helped to solidify the modern myth of Robin Hood. 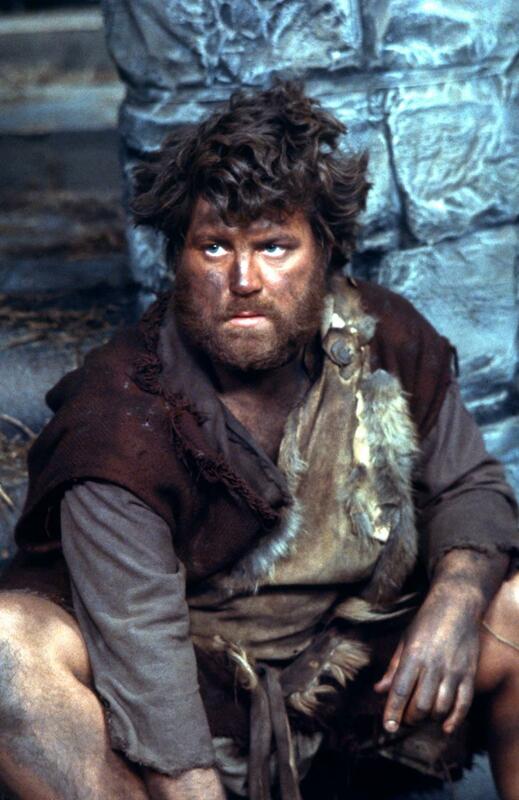 Robin (referred to as Locksley for most of the serial) appears throughout and his characterisation here – a freedom fighter first, an outlaw second – chimes with how we view Robin today (the Robin Hood of the earlier ballads was a much less likeable and noble chap). Scott wasn’t the first writer to set the struggles of Robin Hood during the reign of Richard I, but this story undeniably helped to create the template which many in the future would emulate. Certain aspects of the Robin Hood myth are established here – most notably the way that Robin splits the arrow of his challenger during a test of skill. It’s also interesting how subsequent writers took aspects of Ivanhoe’s character – his return to England from the Crusades, for example – and grafted them onto Robin. The opening episode wastes no time in creating a sense of place and time. With the rightful King of England, Richard, believed to be languishing in a foreign jail, his brother John sees an opportunity to sieze power. The downtrodden Saxons find themselves suffering under the rule of the Normans, whilst Sir Brian casts a baleful shadow over proceedings. Right from his first appearance, Anthony Bate impresses as Sir Brian. Although Bate tended to play establishment types and professional men, he throws himself into this role – a black-hearted villain, albeit one with his own code of honour – with gusto. Eric Flynn, as Ivanhoe, is perfectly cast as the square-jawed hero. Whilst it’s true that Bate, as befits a baddy, has the more interesting role to play, Flynn has a boyish charm which suits the character. Ivanhoe’s first acknowledged appearance is held back until the end of the opening instalment (although it’s rather obvious that the mysterious hooded pilgrim who makes several enigmatic comments throughout the episode is Ivanhoe). That he and Sir Brian (bitter rivals from the Holy Land) happen to run into each other at the castle of Ivanhoe’s estranged father is something of a coincidence …. Clare Jenkins, as Rowena, makes for a very appealing herione (coincidentally she and Flynn had appeared together a few years earlier in the Doctor Who story The Wheel In Space). Rowena and Ivanhoe are in love but he has a challenger for Rowena’s affections, the arrogant de Bracy (David Brizley), a Norman lord. Rebecca (Vivian Brooks), daughter of the despised Jewish moneylender Isaac of York (John Franklyn-Robbins), is somewhat taken with Ivanhoe (she nurses him back to health after Sir Brian gains the upper hand during Prince John’s tourney) but she’s doomed to be unsuccessful as Ivanhoe only has eyes for Rowena. Sir Brian later attempts to woo Rebecca, but she shuns his advances. Ivanhoe was Vivian Brooks’ third and final television job (following appearances in Thirty Minute Theatre and Z Cars). It’s a slight mystery why she didn’t go on to have a longer career as she’s really rather good here, especially when she and Bate cross verbal swords. Brooks may have been very inexperienced compared to Bate, but she more than holds her own during the scenes where Sir Brian and Rebecca warily circle each other. Vivian Brooks certainly has the meatier of the two main female roles (Clare Jenkins’ Rowena doesn’t have a great deal to do except pine for Ivanhoe). Although Vivian Brooks only racked up a handful of credits, most of the other main roles were filled by very familiar faces. That Ivanhoe was directed by David Maloney should be fairly obvious by taking a quick glance at the cast list. The likes of Graham Weston, John Franklyn-Robbins, Tim Preece, Michael Napier Brown, Bernard Horsfall, Noel Coleman and Hugh Walters had already appeared or would later appear in other productions directed by Maloney. David Maloney, like many other directors, tended to use a “rep” of actors – dependable people he knew would deliver the performances required. The strength in depth of the cast is one of the reasons why this serial works as well as it does. Tim Preece entertains as the capacious and vain Prince John, Hugh Walters is pleasingly off-kilter as Cedric’s fool Wamba, Bernard Horsfall is suitably imposing as the Black Knight, John Franklyn-Robbins impresses as the persecuted Isaac and Noel Coleman is characterically strong as Fitzsurse, one of John’s advisors. Clive Graham, as Locksley, also offers a vivid performance and it’s always a pleasure to see Michael Craze, here as one of Lockley’s men (Thomas). Graham Weston, clearly one of David Maloney’s favourite actors (apart from Ivanhoe, Maloney cast him in two Doctor Who stories – The War Games and Planet of Evil), gets a chance to display his skills with a quarterstaff when his character – Ivanhoe’s loyal servant, Gurth – tangles with the outlaws. It’s not a badly directed sequence, although like all fight scenes taped in the studio it pretty much had to be done in a single take (had it been shot on film then it could have been edited much more tightly). 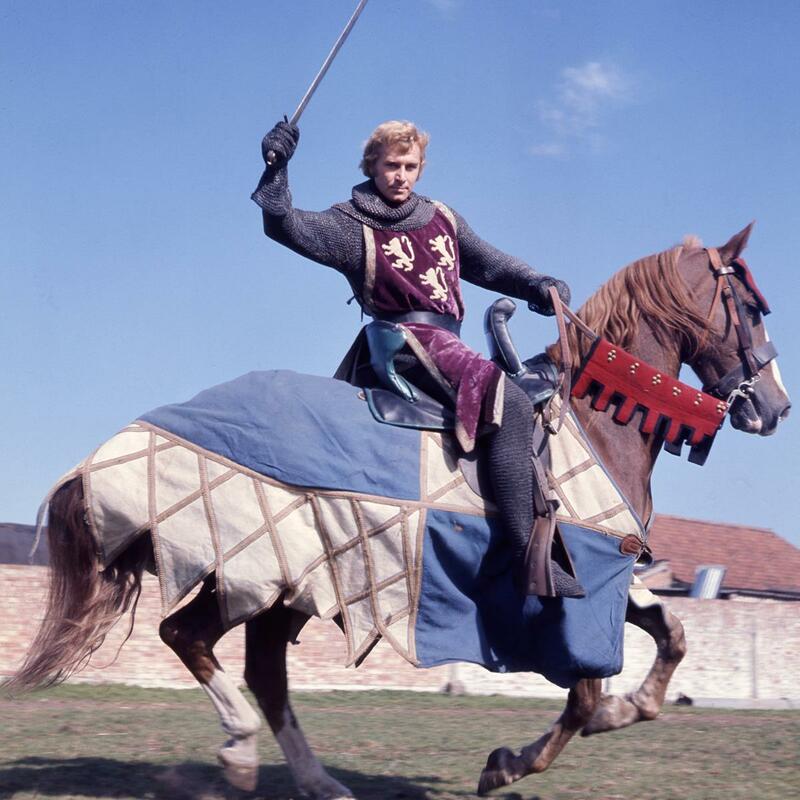 With Ivanhoe injured and insensible during the middle part of the serial, other characters move to the forefront of the action. Bernard Horsfall’s mysterious Black Knight (a vision in blond wig and beard) has an entertaining tustle with Barry Linehan’s disolute Friar. The Friar, living the life of a hermit deep within the forest, may claim to exist on a diet of peas and water but the truth is rather different! When Ivanhoe, Cedric, Isaac, Rebecca and Rowena are captured by a group of Norman knights led by Sir Brian, they find themselves the prisoners of Godfrey Front de Boeuf (Francis de Wolff). Godfrey has usurped Ivanhoe’s lands and now seeks his death in order to secure his position. de Wolff cackles with evil intent (like Peter Dyneley he’s somewhat of a stranger to subtlety). Rebecca is later denounced as a witch by the leader of the Templars – angered by Sir Brian’s infatuation with her – and is sentenced to death. 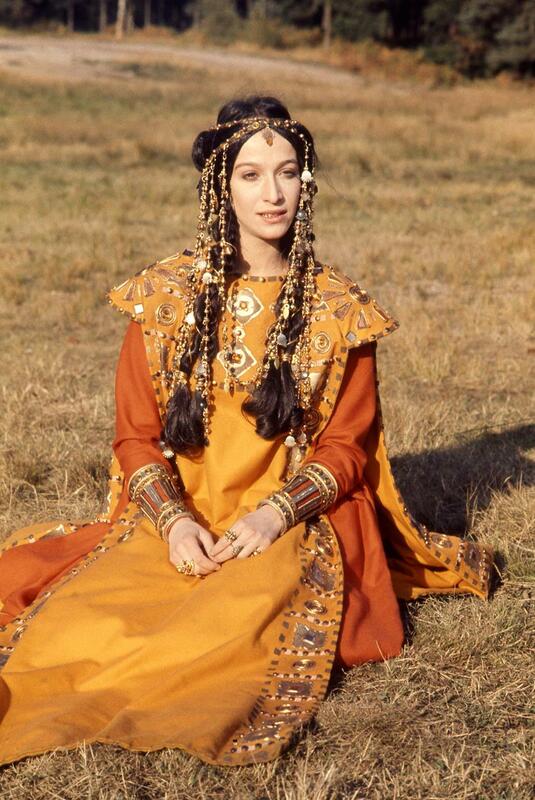 She claims the right of trial by combat and nominates Ivanhoe to be her champion. And with Sir Brian in the opposite corner it seems that the final reckoning between them is now at hand …. Although the Classic Serials had just moved into colour, this ten part adaptation (broadcast during January, February and March 1970) maintained the same production model from the black and white days. Therefore the bulk of each episode was recorded on videotape in the studio, with film inserts used to open out the narrative. Whilst this means that it isn’t as glossy or filmic as some of the later television versions, the quality of the performances are more than adequate compensation for the occasional production shortcomings (such as the unconvincing beards and the way some battles largely take place off screen). Although some of the turns are rather on the ripe side (there are times when it’s impossible not to be reminded of Monty Python and the Holy Grail) there are subtler pleasures to be found elsewhere – Anthony Bate, for example, is excellent throughout. Overall, this is a strong and faithful adaptation of a sprawling epic and certainly deserves a place in your collection. 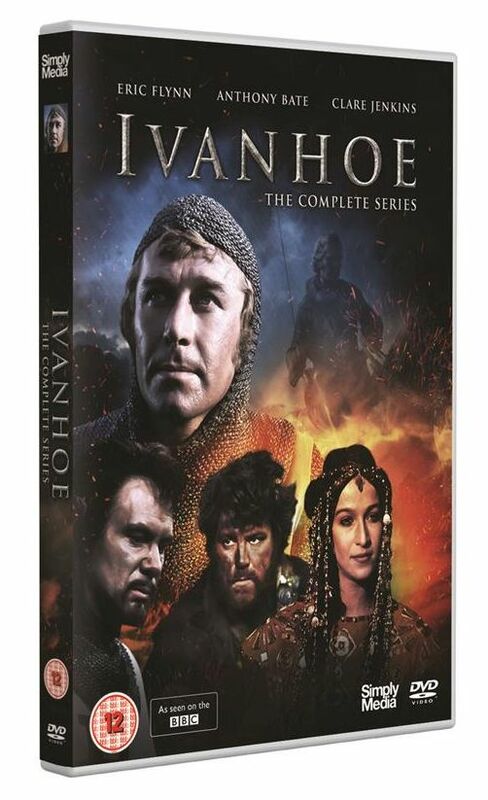 Ivanhoe is released by Simply Media on the 18th of September 2017. The RRP is £19.99 and it can be ordered directly from Simply here. I remember seeing this the first time round and recall it as being very good. Walter Scott is always a good bet for TV and film dramatisation. His novels can be heavy going at times. Finally – I’ve waited so long for this. Glad to see Anthony Bate in one of his most impressing roles. Have been trying to find information on this version for years, which made such an impression on me as a ten year old – at last have been able to see it again. Fascinating to re-live this memory. In spite of it’s faults, it remains the definitive version of this great novel for me – A gem! P.S. Does anywhere know where this series was filmed?